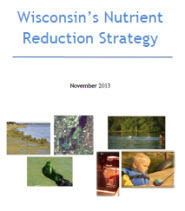 Wisconsin’s Nutrient Reduction Strategy is a broad overview of nutrient management activities for both point sources and nonpoint sources in Wisconsin. This strategy documents ongoing activities whether they are implemented by federal, state or local agencies. It identifies areas where further progress is needed. Subscribe to phosphorus rule updates. The Wisconsin Nutrient Reduction Strategy, developed with partners and finalized in 2013, envisioned that implementation progress would be measured, tracked and reported to the public. 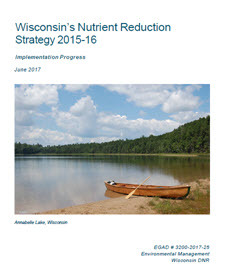 This Implementation Progress report provides a comprehensive description of the substantial and widespread efforts to reduce nutrient losses to Wisconsin rivers, lakes and streams. Nutrient reduction is being accomplished through existing programs at the local, state and federal level that either regulate point sources or promote conservation practices by agricultural non-point sources. Most importantly, implementation is occurring at the watershed scale through partnerships between municipalities/sanitary districts, county land and water conservation departments, farmers, environmental/watershed groups, UW Extension and state/federal agencies to improve water quality. With partners working together, outreach and education are provided, planning is accomplished and practices are implemented that lead to measurable reductions in nutrient losses. 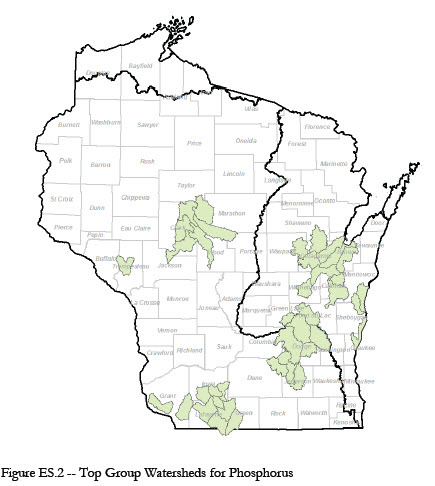 Wisconsin's Nutrient Reduction Strategy was developed in response to the Gulf Hypoxia Action Plan 2008 call for each state in the Mississippi River Basin to develop a strategy by 2013 to reduce the amount of phosphorus and nitrogen carried in rivers from the state to address the biological "dead zone" in Gulf of Mexico. It was also developed in response to the call from the U. S. Environmental Protection Agency (EPA) for states to develop frameworks for nutrient reduction as outlined in the March 2011 memo from Nancy Stoner, Acting Assistant Administrator for Water. Although EPA will review and provide comment on this strategy, it does not require EPA approval. Having a completed strategy may make Wisconsin eligible for additional federal funding and may be necessary to retain existing grants. Wisconsin's Nutrient Reduction Strategy was developed to not only meet the federal Gulf of Mexico hypoxia nutrient reduction goals, but to meet intra-state needs for Wisconsin's lakes and streams and groundwater. It also includes needs for the Great Lakes consistent with Annex 4 of the Great Lakes Water Quality Agreement of 2012. 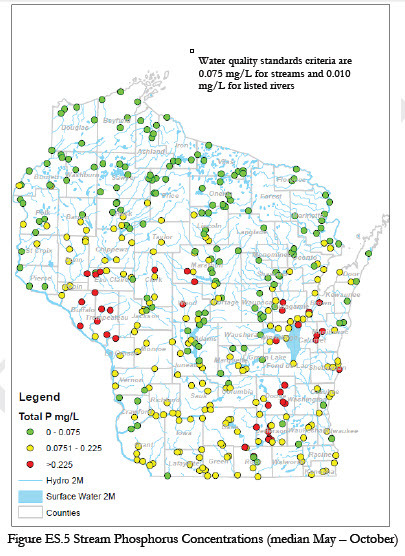 Past implementation efforts have reduced by about 23 percent the amount of phosphorus from Wisconsin watersheds to the Mississippi River and by about 27 percent to Lake Michigan. 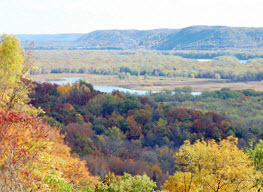 By continuing to implement existing state and federal programs, Wisconsin can meet the 45 percent reduction goal for the Mississippi River Basin. This strategy does not call for new regulations for either point sources or nonpoint sources. It builds on existing programs and existing requirements, including those adopted in the last few years. 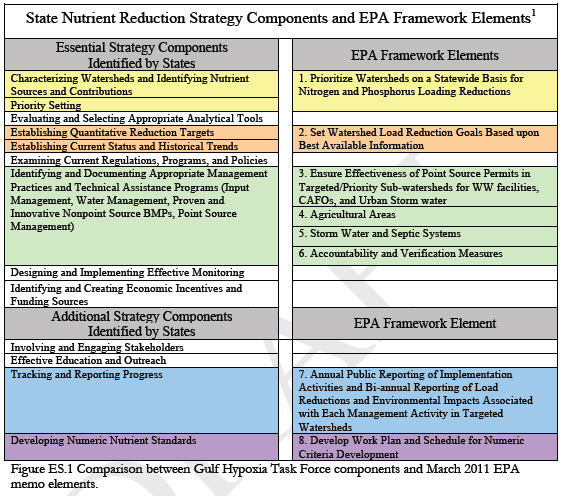 This strategy is generally organized around the eight elements outlined in EPA's March 2011 memo. However, it also addresses the essential strategy components to implement the Gulf Hypoxia Action Plan 2008. It is intended to be a "living" document that changes to reflect new developments and advances in Wisconsin's nutrient reduction efforts. The nutrient strategy is comprised of the following sections, which are accessible in PDF format below for your convenience. You may also wish to download or read the document in its entirety, which is available from the link above. Nutrient contributions come from both point sources and nonpoint sources throughout much of the state. For the Mississippi River basin portion of Wisconsin, 80% of the nonpoint source contribution of phosphorus comes from 20 of the 30 major river (HUC 8) basins. Similarly for the Lake Michigan basin, 80% of the nonpoint source contribution comes from nine of the 13 major river (HUC 8) basins. The relative point source and nonpoint source nutrient contributions vary greatly by basin. Initial lists of high priority "top group" HUC 10 watersheds comprising about 10 percent of the state's watersheds were developed for the Mississippi River Basin and Lake Michigan Basin for phosphorus and nitrogen to surface waters and for nitrates in public drinking water wells. The initial list and subsequent updates of the list may be used in selection of future federally-funded implementation projects. Recent stream water quality monitoring conducted by DNR shows a broad range of phosphorus and nitrogen concentrations as illustrated in Figures ES.5 and ES.6. 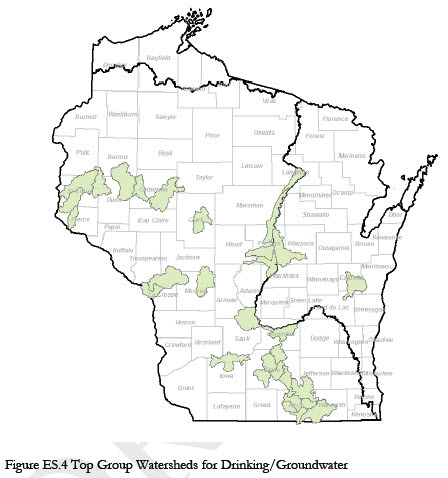 About half of Wisconsin streams meet the phosphorus water quality standards criterion. There are no water quality standards criteria for total nitrogen or nitrate. 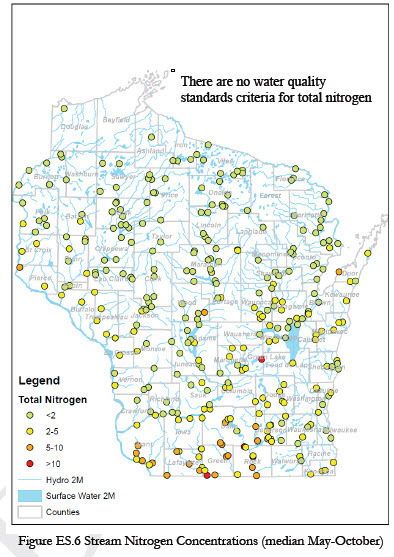 Many of Wisconsin's public drinking water systems have elevated nitrate concentrations with some exceeding the enforcement standard of 10 mg/L. 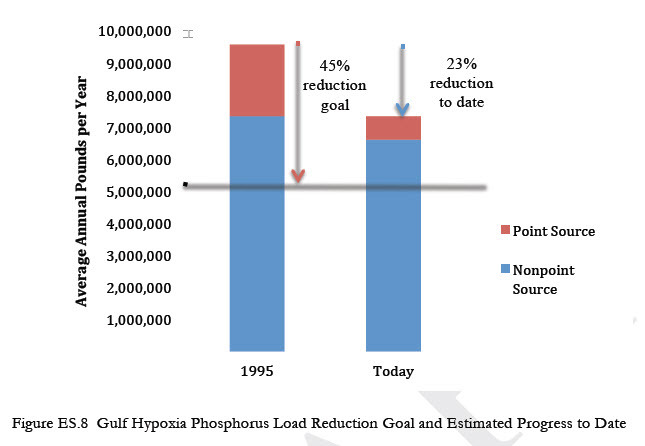 An initial analysis shows that existing Wisconsin point source and nonpoint source programs can meet the Gulf Hypoxia goal of 45% load reduction for phosphorus using 1995 as a base year. For the Mississippi River Basin, about a 23% reduction has already been achieved through implementation of Wisconsin's point source phosphorus removal requirements and through a number of nonpoint source management programs. For the Lake Michigan Basin, an estimated 27% reduction has been achieved. Trend analysis of data collected over more than three decades at long-term monitoring river monitoring sites shows a decrease in phosphorus concentrations for much of the southern half of the state. In contrast, nitrogen concentrations have increased somewhat. The Department of Natural Resources very much appreciates the inter-agency cooperation provided to develop this document. In particular this cooperation was exhibited by three work groups convened to fill programmatic gaps and enhance coordination. Astrid Newenhouse, UW-Extension, served as recorder for all three workgroups.